The GOP passed the most massive tax bill since more than 30 years. While the bill is known for helping large corporations, the plan will impact each taxpayer’s personal finance in significant ways. First, to get an understanding of how the GOP tax bill will impact you, you have to understand the current tax laws and the expected changes. Currently, an individual can take the higher of the standard deduction or itemized deduction on their tax return. Both deductions reduce taxable income under the GOP tax plan The current standard deduction for filers is single $6,350, head of household $9,350, and joint filers $12,700. Itemized deductions include amounts paid for charity, medical, mortgage interest, casualty losses, state and local taxes and other expenses. An individual will still be able to take the higher of the standard deduction or itemized deduction on the tax return. The standard deduction doubles for tax filers. The amounts will increase to single $12,000, head of households $18,000 and joint filers $24,000.Some itemized deductions will be eliminated or limited. Casualty losses will no longer be deductible unless it is a federally declared disaster. Mortgage interest will be limited to mortgage debt of $750,000. State and local taxes are limited to $10,000. How will this impact me – If you live in states with high state and local taxes, you may not benefit from the change. Also, if you experience a loss due to a casualty, you may not help unless it is a federally declared disaster. The current tax law allows for persons to claim a deduction of $4,050 per person for each spouse and dependent. The personal exemption reduces taxable income and very advantageous to those who have a large family and a number of dependents. 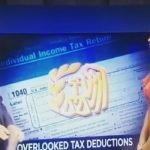 The deduction does not depend on your filing status but could be phased out if you are a high-income earner. The new tax law is expected to do away with the personal exemption. How will this impact me – If you have a large family with many dependents, you may not benefit from this change. The current tax law allows a child tax credit of $1,000 per person and limits the credit to those with moderate-income (up to $110,000). The credit is available to those who have children under the age of 17 and meet certain tests. The bill is expected to increase the credit to $2,000 per child and extend the credit to higher income tax earners (up to $400,000 joint). How will this impact me- If you have children dependents, you can expect to benefit from the child tax credit. According to the Tax Policy Center, high-income taxpayers will receive the largest tax savings under this bill. The Center also estimates that the average middle-income taxpayer will pay about $900 less under this bill. The amount of tax savings will depend on your personal filing status, income, and the number of dependents. But overall, middle-income individuals can expect to see small to modest tax changes over the next ten years. Kemberley Washington is a certified public accountant, author of The Ten Commandments to a Financial HealingHow th and owner of Washington CPA Services, LLC. Follow her on Twitter at @kemwashcpa.